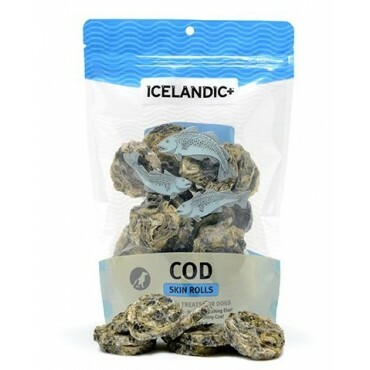 These 100% natural and edible Icelandic Cod Fish Skin Rolls are single ingredient and contain no additives, preservatives or supplements. They come only from the pure icy waters of Iceland and are line-caught daily and processed immediately. Not only are they delicious for your dog, they reduce tartar and plaque build-up for healthier gums and teeth. They are also a great natural source of Omega-3 fatty acids, promoting healthy skin and coat for your pet. With just one ingredient, these tasty and healthy treats are perfect for dogs with protein sensitivities. These natural and edible fish products offer peace of mind, as they are cleaned and air-dried within FDA, USDA, EU, and MAST standards and regulations. Because Iceland almost never gets warm, our fish always remain cold after being caught. As a result, they have less smell than other fish treats in the market. Enjoy peace of mind. These fish treats are cleaned and air-dried within FDA, USDA, EU, and MAST standards and regulations.